Andy: I had a bad experience with vanilla rum (read vomit) so I am not sure I am a good one to ask, but it does have a very strong vanilla smell. Taste actually kind of creamy, not as much like vanilla extract as some others, more like a decent vanilla ice cream. Mixed with pineapple you can still taste the creaminess, almost like a creamcicle. I suppose it is a decent and inexpensive choice if you desire such a flavor. Much better than the Mt. 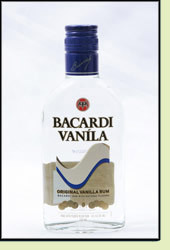 Gay Vanilla rum. Adrian: This has a nice vanilla taste, but is a little tough to drink straight. The pineapple juice kind of washes out the vanilla taste.